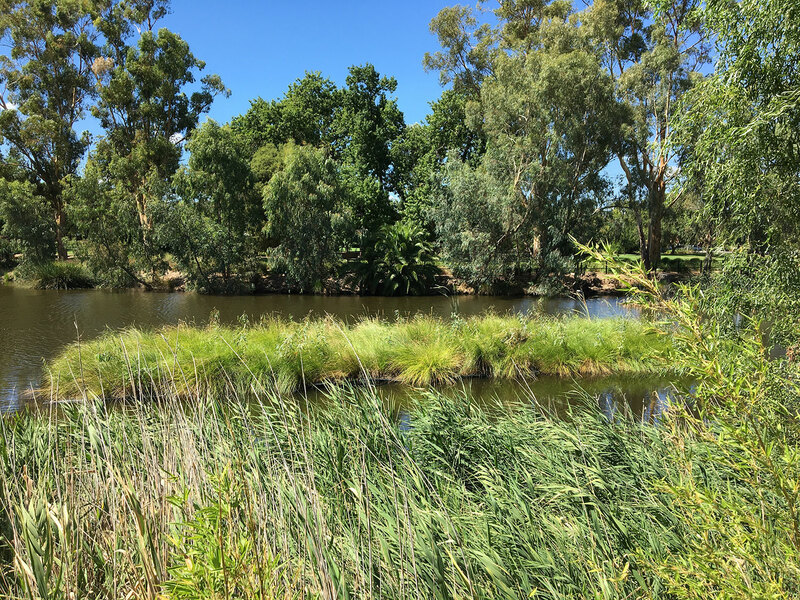 Wollundry Lagoon floating wetlands and floating reedbeds project is located in the central city area, sized approximately 120m2, maintained by rainfall and storm water runoff from the surrounding city and peri-urban catchment. 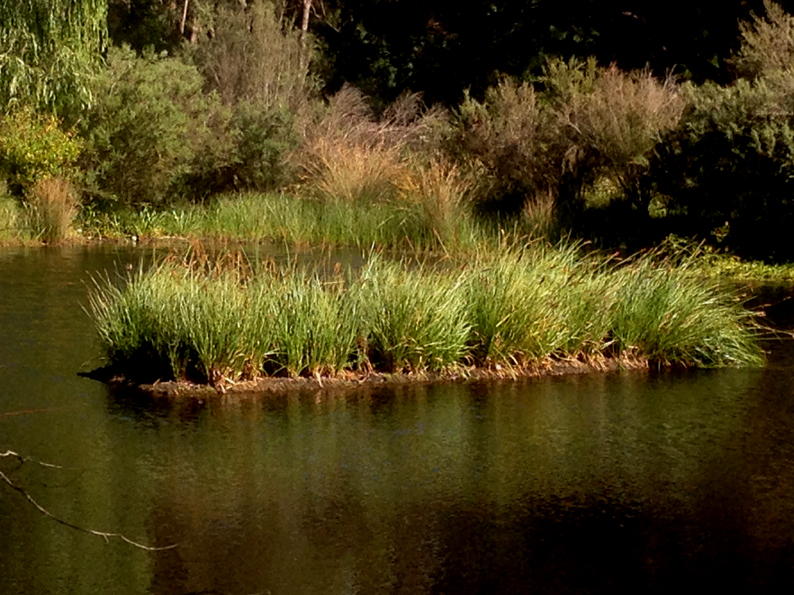 Located within Wagga Wagga, the lagoons are affected by nutrients and pollutants. The lagoon is valued for community amenity, visual value and recreation. 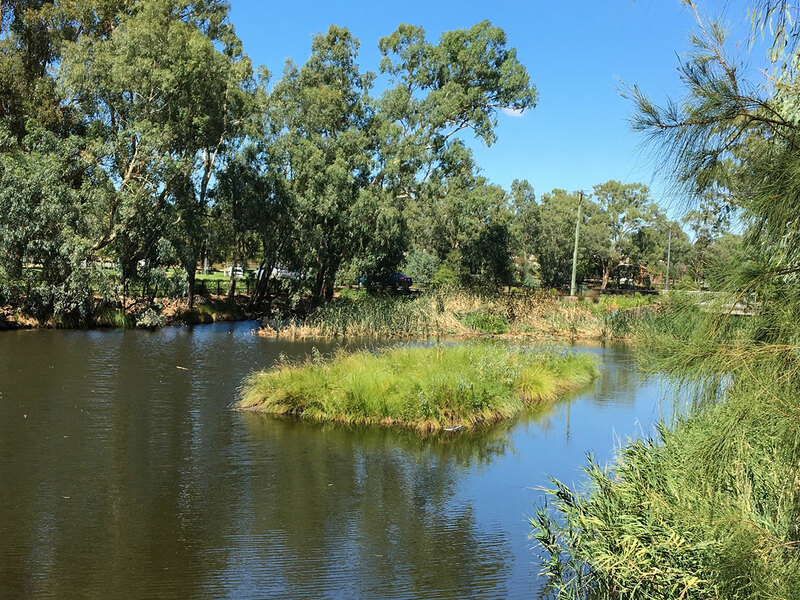 The ecosystems contain a variety of life that contribute to a healthy catchment and also help purify urban run-off entering the Murray river catchment. 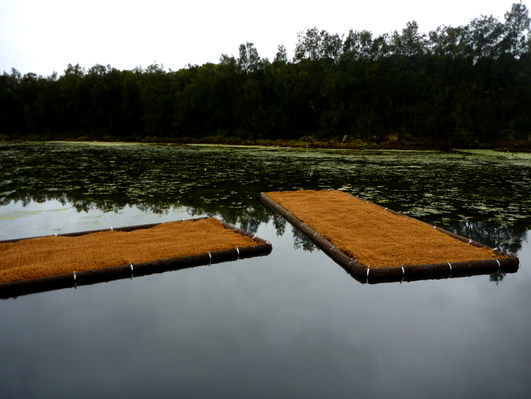 The purpose of the floating wetlands is to provide an enhanced treatment above and beyond existing water quality. Plant establishment has been successful during winter with plants quickly colonising the floating biofilter media and is maturing. Client dams overflow into local waterways carrying sediment and nutrients, affecting river water quality. 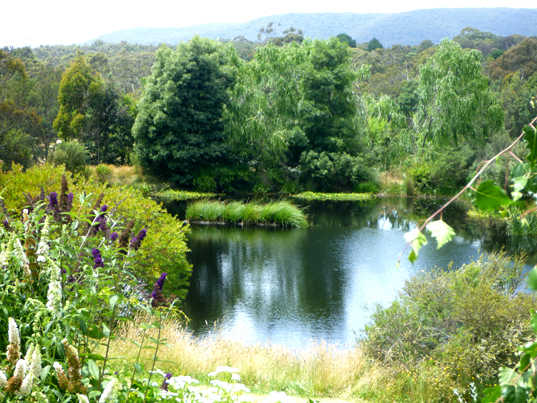 Land owners wanted to improve their dam’s environmental performance, improve the water quality in the dam, and provide habitat for birds and amphibians that was aesthetically pleasing. The design team visited the site and proposed a design that would capture as much nutrient and sediment as possible before water overflowed into the local environment. Natural materials were used, giving the floating reedbed a natural island aesthetic that would suit any dam, lake or wetland. Sydney Olympics in year 2000 set the world benchmark for a Green Olympics that still sets the standard for excellence. Extremely rare, threatend and endangered marine estuary ecosystems exist within the Sydney Olympic Park Authority area over 1000 hectares within Sydney City, New South Wales (NSW), Australia. The Badu mangroves estuary has black swiflet water birds and also migratory birds that travel from Australia up to Korea and Siberia every year. The tidal water level variation is approximately 1 metre twice per day, and the floating islands were designed to rise and fall one metre per day, and provide an island habitat for the water birds. The existing earth mound island was being inundated in high tide which destoys the rare and endangered bird nests and consequently their eggs which is keeping the marine estuary water bird population low. Due to very rare saltmarsh ecosystems on site, the sensitive ecosystem could not be subject to the impacts of earthworks machinery. 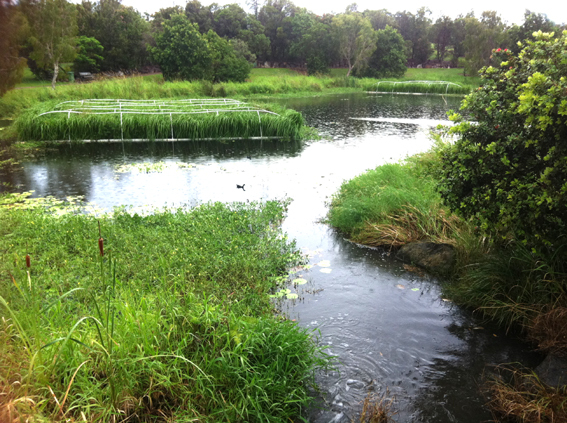 A team of environmental scientists, planners and engineers surveyed the site with Sydney Olympic Park Authority (SOPA), identifying suitable sites for an Aqua Biofilter™ installation and appropriate materials for migratory and local water birds for nesting. 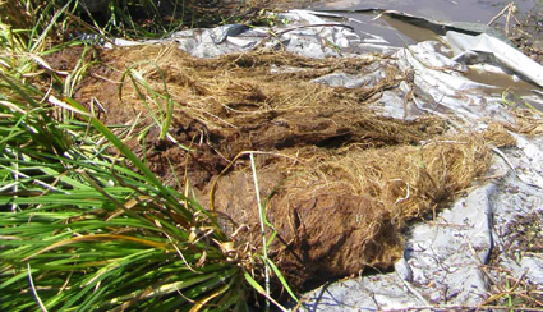 Coconut fibre beds were combined with long lasting food grade plastic floatation frame covered to prevent UV degradation. Marine grade materials were utilised to ensure long term integrity of the floating islands. 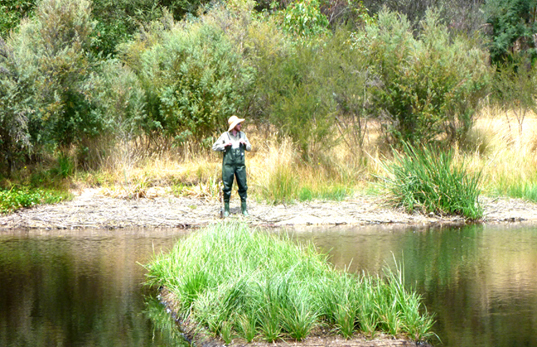 Sydney Olympic Park Authority rangers collected salt marsh bush seeds from on site, which the team sowed into the floating islands before launching the islands into the marine estuary. This is a world first that marine species have been integrated into marine floating islands for habitat and biofiltration. The primary purpose is habitat, but over time there marine plants will add to biofiltration benefits for the water quality. Installation of 120m2 of Aqua Biofilter™ in total was completed June 2012, made up of two islands, both 60m2 each. It is expected that bird watching enthusiasts will be able to utilise the bird hides located on site to view the rare water birds nesting, also alongside black swans which are a popular favourite with the locals. Kuala Lumpur’s River of Life program is $US 1 billion program to clean up the Klang River to re-invigourate the city in regards to water quality the new river promenades and community living spaces. Aqua Biofitler was requested to provide products to a variety of engineering firms contracted to build out the River of Life project. The infill of existing flood control water bodies with floating wetlands is a low cost method of improving water quality in existing water assets that were experiencing algal blooms, aquatic weed infestations and breakout of illness in fish. 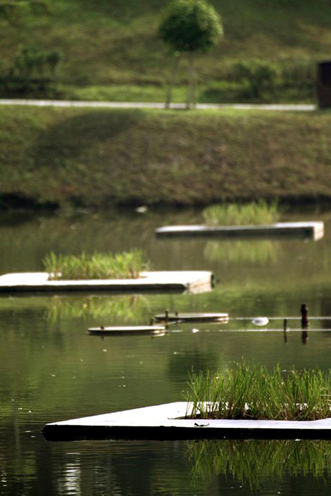 Kuala Lumpur has significant stormwater treatment challenges with a constraint on land availability for conventional stormwater treatment wetlands so decided instead to install floating wetlands into existing stormwater and sediment ponds, with the reduced costs of not having to excavate new land and deal with issues of long lead times and three times the expense. It was decided to install 1000m2 into two sites in June 2012. 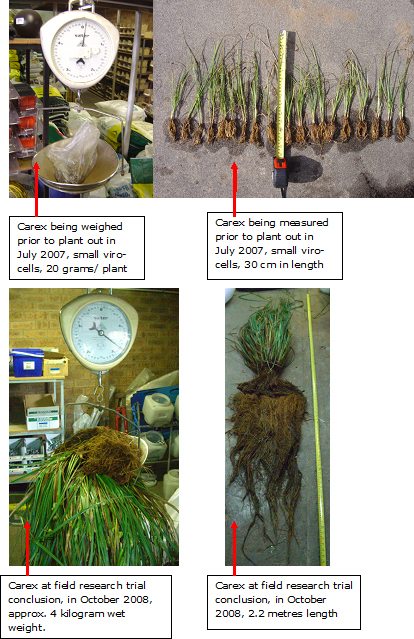 After 12 months performance the vetiver plants grew well with roots reaching down to nearly 3 metres. Previous years algal blooms have occured and it had been noted there was visible and sedimentary pollution of concern, but after installation of the floating wetlands there have been no blooms and the accumulated pollution was being treated by the installation. The floating wetlands performed an ecosystem function of reducing nutrients to levels that prevent algal and aquatic weed outbreaks. 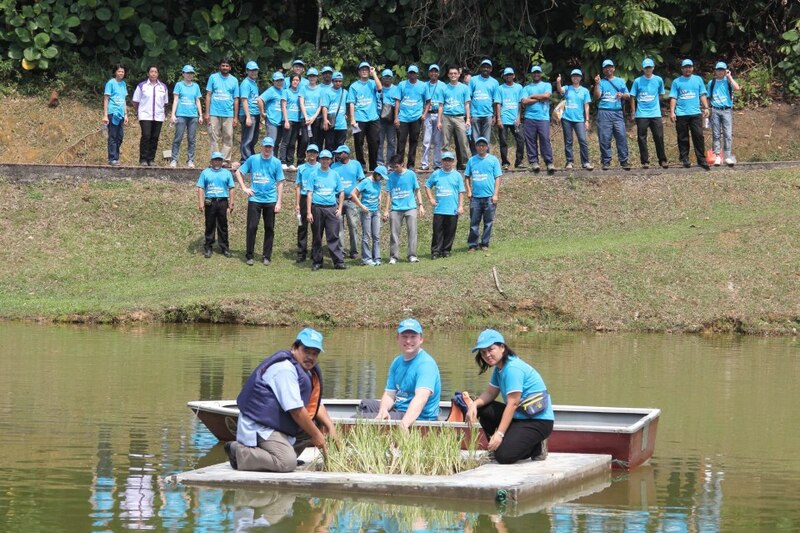 Additionally installations in public garden ponds for water quality improvement and beautification was implemented with local charities as part of the Malaysia National River Forum September 2012. 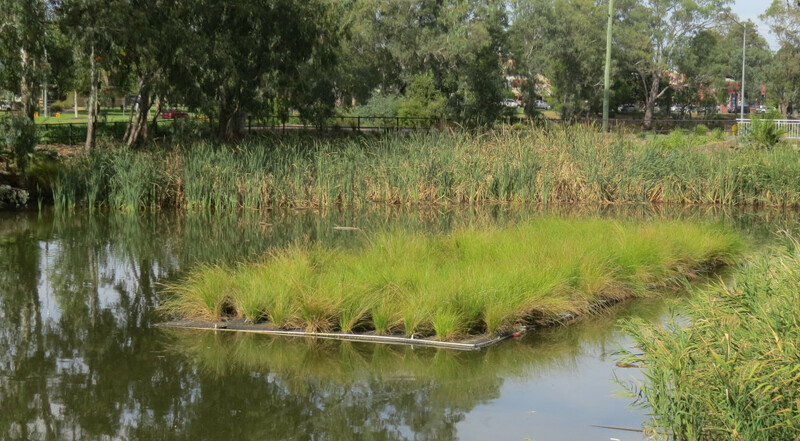 Gold Coast City Council has significant stormwater treatment challenges with a constraint on land availability for conventional stormwater treatment wetlands so decided instead to install floating reedbeds into existing stormwater and sediment ponds, with the reduced costs of not having to excavate new land and deal with issues of long lead times and three times the expense. It was deciced to install 520m2 (520 square metres) into two sites in June 2011. After 12 months performance the plants have grown to maturity with leaves reaching 1 metre height and roots down to nearly 2 metres. Previous years algal blooms and azolla blooms have occured, but after installation of the floating reedbeds, there have been no blooms. This indicates anecdotally that the floating reedbeds have performed well and reduced nutrients to levels that prevent algal and azolla outbreak. 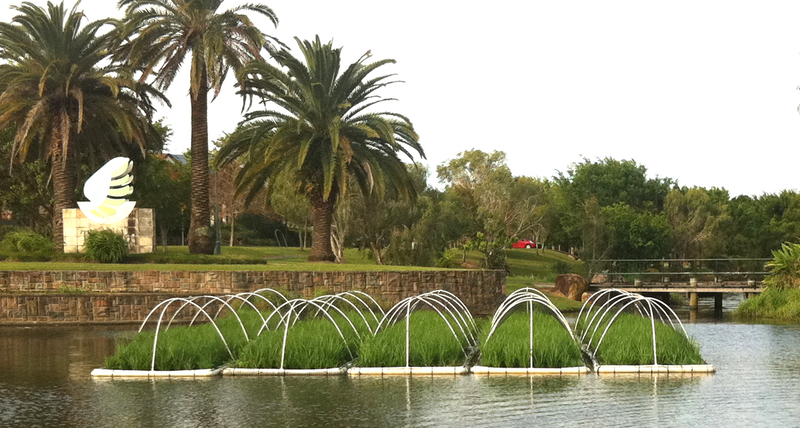 Installation was completed Bega urban wetlands receive the majority of the town’s stormwater with a catchment over 60 hectares in size. The urban wetland also becomes a flood plain flow path annabranch rising up 7 metres in height. The Aqua Biofilter™ demonstrated it’s high quality construction, rising and falling with the 7m flood, with it’s anchor performing well, and plants growing vigourously with the high pollutant loads being delivered to the wetland. 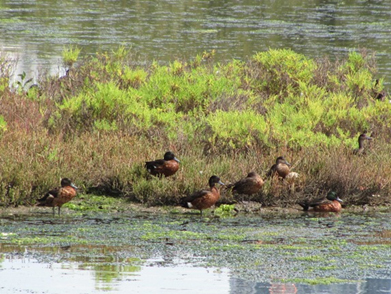 The Bega Urban Wetlands case study can be downloaded as a pdf document, that was published at the National Australian Stormwater Conference 2009 uptakes of iron metals readily at 42,000 mg/kg. Uptake of manganese readily at 7,700 mg/kg, by some carex varieties that readily take up metals via phytoremediation process into rootzone. Total Nitrogen removal of approx. 40kg of in just 200m2 of treatment area. Bega floating reedbed rootzone of carex fascicularis is considerable. Bega floating reedbed rootzone of carex fascicularis is considerable. Note the lateral root growth and joining of root zones of adjacent plants. 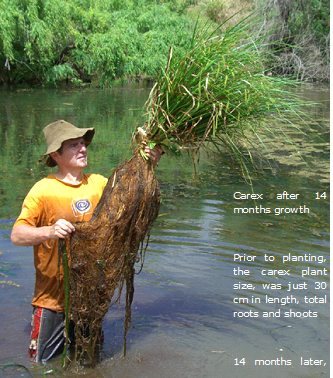 This strengthens the overall floating reedbed and provides better water quality improvement performance than compared to plants that send roots straight down, such as Carex appressa which in the same trial proved to grow only vertically, not laterally. This makes species selection important to attain lateral root growth for performance. Professor Li and Prof Pu hosted the team for involvement in the floating wetlands and floating island projects in China. The images below give an indication of the scale of some of the trial sites. The floating wetlands are part of On Site Sewage Management (OSSM) approach, intregrating stormwater treatment additionally. Large constructed wetland with weirs separates the floating reedbeds and floating islands, treating all sewage and stormwater before discharge to river, whereby water is accessed for re-use. The floating wetlands are configured with Chinese characters written with plants, which when seen from above in the adjacent apartment buildings read ‘Respect Water’, with the aim of building public awareness about water quality issues. 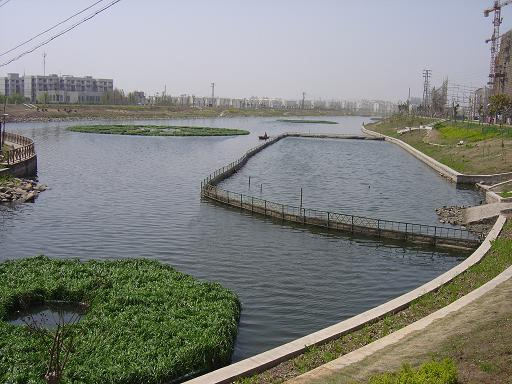 Large urban development in China utilising floating treatment wetlands biomass for a biodigestor that improves overall waterwater treatment performance, whilst providing city precinct district energy & heat production, integrated with sewerage system. Advanced Biofiltration Research and Technology development has been an emerging science in China for manyceb years. 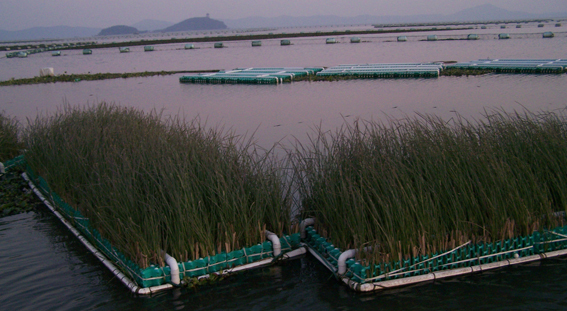 The Floating Treatment Wetlands in China provided an opportunity for innovation, recyling nutrients and biomass energy. 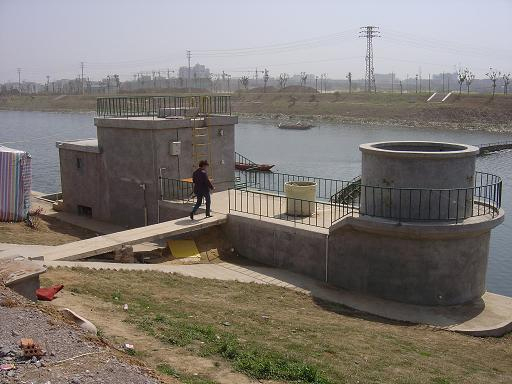 A biodigester was designed and built by Prof Ou and design of the Chinese character systems by Prof Pu. 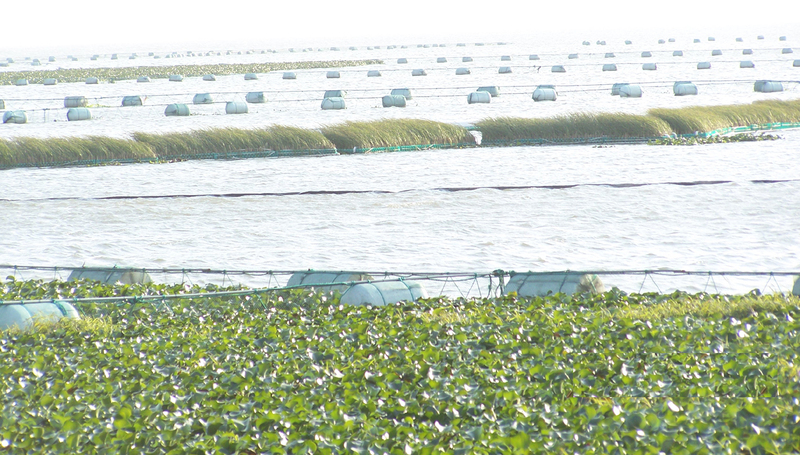 The biomass harvested regulary from the floating wetlands and contained water hyacinth is inputtted to the biodigestor, where biogas fuel is produced for energy applications. Local organic wastes are also inputted to the biodigestor, genertaing additional biogas for energy applications. The cycling of nutrient dense waste water, and stormwater, with the addition of local organic wastes for biogas energy applications, demonstrates the effectiveness of the zero emissions approach. Mining run-off with contaminants including heavy metals and sediments was entering a drinking water reservoir that serviced over 10 million people. 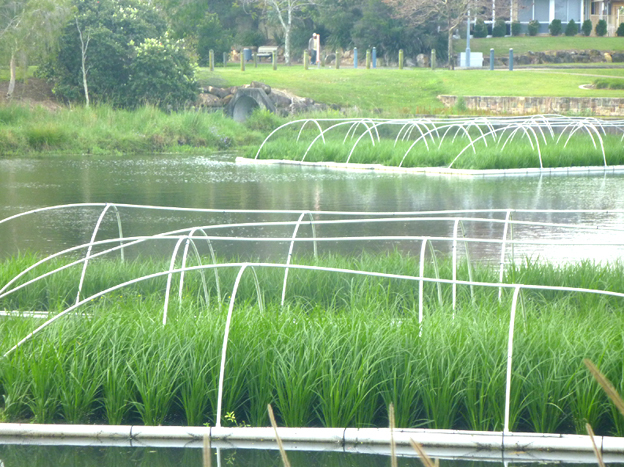 Solutions included installation of floating wetlands with vetiver grass to uptake heavy metals and phytostablise heavy metals, for removal at a later date. Project coordination by expert Prof Pu was required this complex technical project. 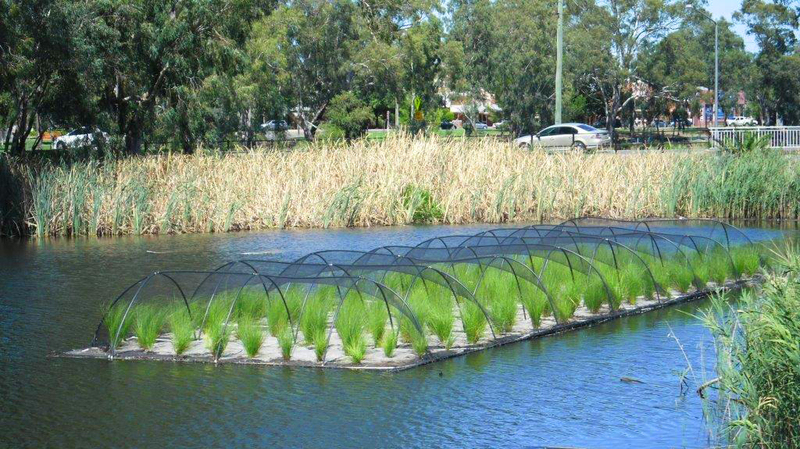 Wave stabilisation floating reedbed rafts were installed to prevent re-suspension of heavy metals in sediment and also prevent waves from from eroding water body banks and releasing sediments, metals, nutrients and impacting bank stability. 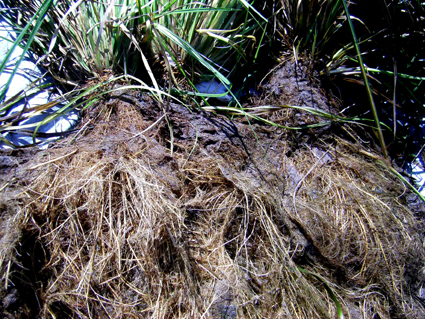 Vetiver grass uptakes significant amounts of nutrient preventing algal blooms that had previously been a problem in the drinking water reservoir. The contstant uptake of available nutrient in the water, reduced nutrient concentrations to the point where algal blooms and aquatic weeds could not grow, which eliminated costly management of troublesome weeds and algal blooms. This also reduces the need for herbicides to be used in drinking water catchments which as a management practice is contrary to public health. 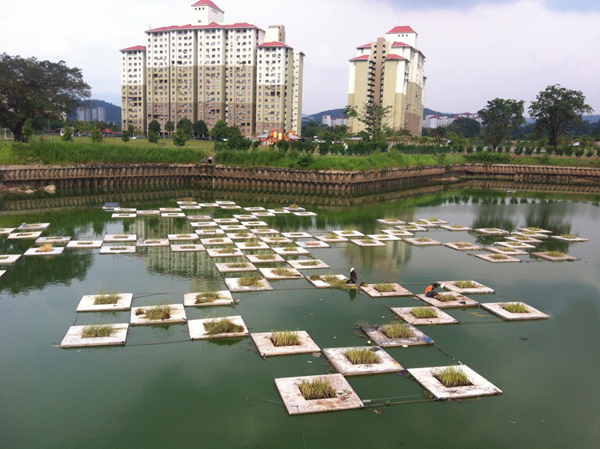 As a total solution floating reedbeds provide a cost effective passive system that mops up pollutants and prevents further degradation of the water body and banks, slowly restoring ecosystem functionality. Aqua Biofilter™ Sewerage Trial to prevent Algae Bloom in 2007 improve water quality, reducing nutrients and correspondingly reduce algal blooms. Algal bloom can kill aquatic life & also block irrigation. 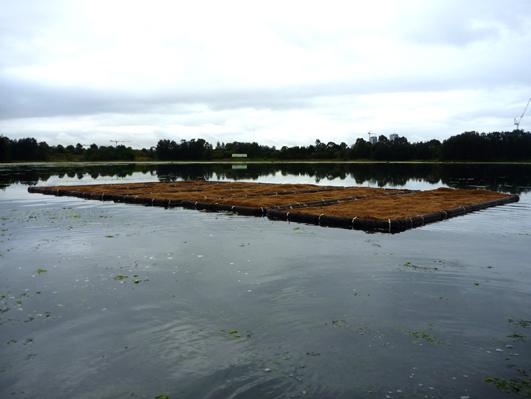 Floating reedbeds and islands can biofilter nutrients reducing available nutrients for algal blooms.